Tale from the work shop Shh?! 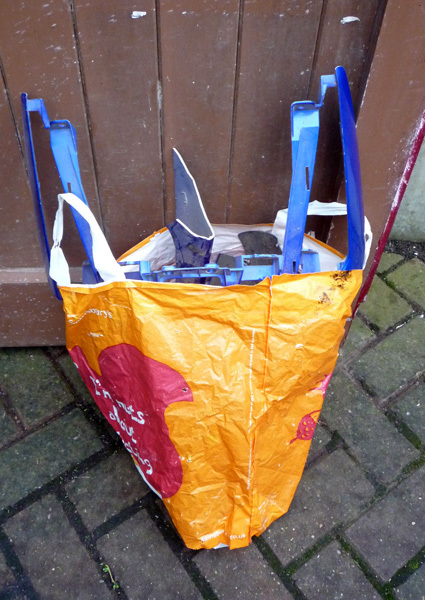 The other day I had to nip out to get some materials. A bit of an under statement as it involved a journey of a hundred miles each way. As we were going up the by pass at the beginning of the trip there was a metallic clanging sound of something hitting the under side of the truck which slowed progress as I considered whether or not to stop and check. Needless to say I didn’t as the van felt and ran OK.
Ninety odd miles later . We stopped at a well known supermarket for a break. To be met by a shushing noise. A quick look round the truck did not show anything untoward but the shh persisted; then I noticed that the rear near side tyre looked soft. In that short time it was half flat, the air was coming out that fast. 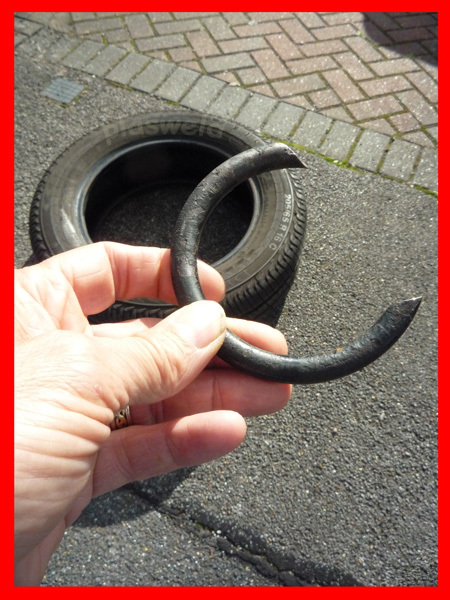 I can’t believe it – another puncture! and its the new one! I will not repeat what was said but I think you can guess! I ran round to the cab pulled out the jacking kit and got it in place just before it went completely flat. Ten minutes later the Tyre was changed. Before we returned home I wanted the puncture repaired, so tracked down a tyre shop and took it in. “No prob’ mate have that done for you in a jiffy”. Then things went sideways I saw him call over a colleague and then me. It took us all by surprise. I was told that I had been extremely lucky that it had not blown apart when it happened. The pictures speak for them selves! It is becoming more and more difficult to go about your business without someone trying to pick your pocket. It does not matter who they are. Public bodies and their contractors are the worst in my opinion. 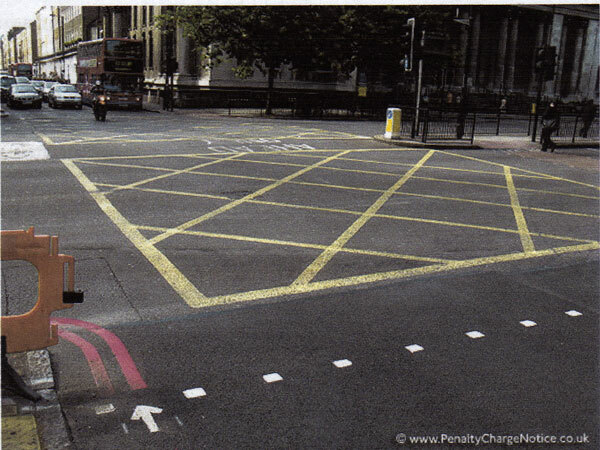 A while ago we received a penalty charge notice from Transport for London. Someone had a sense of humor when naming this body because they have done nothing for transport except making travelling in the capital worse. The PCN stated that we were in contravention of the road traffic act 1991 (as amended) code violation 31 ‘entering and stopping in a box junction when prohibited’. This apparently happened on Barnet way, Marsh lane and Green avenue traffic light junction. The way the junction has been laid out is a mess, and a motorists nightmare but rather than deal with this mess the TFL zealots have used the situation to sting the unsuspecting driver with a hefty PCN that is not valid for several good reasons. Please read on for further clarification. You should not enter the junction if your way ahead is blocked. You can enter a box junction if you are turning right if your way ahead is blocked. You should not stop before a box junction if the way ahead is clear. Is there any ambiguity with those rules? If you read the act itself (part printed below) the way it is written could possibly lead you to believe you are in contravention. (b) a reference (however expressed) to a vehicle which is stationary or stops within a box junction includes a vehicle which is stationary whilst part of it is within the box junction. 7. – (1) Except when placed in the circumstances described in paragraph 8, the road markings shown in diagrams 1043 and 1044 shall each convey the prohibition that no person shall cause a vehicle to enter the box junction so that the vehicle has to stop within the box junction due to the presence of stationary vehicles. (b) stops it within the box junction for so long as it is prevented from completing the right turn by oncoming vehicles or other vehicles which are stationary whilst waiting to complete a right turn. 8. When the road marking shown in diagram 1043 or 1044 is placed in conjunction with the signs shown in diagrams 615 and 811 on an area of carriageway which is less than 4.5 metres wide at its narrowest point, the road marking shall convey the prohibition that no person shall cause a vehicle to enter the box junction so that the vehicle has to stop within the box junction due to the presence of oncoming vehicles or other stationary vehicles beyond the box junction. To be honest like a lot of motorists who get these PCNs we were shocked that we had been issued it, knowing that when we entered the box junction the road ahead was clear and flowing. So we did some research and those checks lead us to believe that the contravention maybe a fraud. So we appealed to TFL with clear retorts. As suggested by those in the know, they rejected our representations.When the rejection turned up it was still a surprise but true to form. Apparently most representations to TFL are rejected, even if your case is very clearly in your favour. Now this is where things get interesting we made representation to the Parking and Traffic Appeals service as it was known then. Now I believe it is an Ombudsman. Once we put in our appeal TFL sent us their so called evidence and threats. Short of the junction and two boxes side by side. You would not have to take your defence of a contravention to appeal if your accuser provided you with the full evidence to back up their accusation. All they send are couple of pictures – (none of which show the vehicle with number plate in the same picture at the point of the so call contravention), – this is not evidence. In my opinion it could be your number plate tacked on to any vehicle. It is also my opinion that it is sharp practice if you have to pay for alleged video evidence. It is not good enough that you can go to their offices (several 100 miles away) and view it for free. You should be able to view it where it is most convenient for you as the accused. 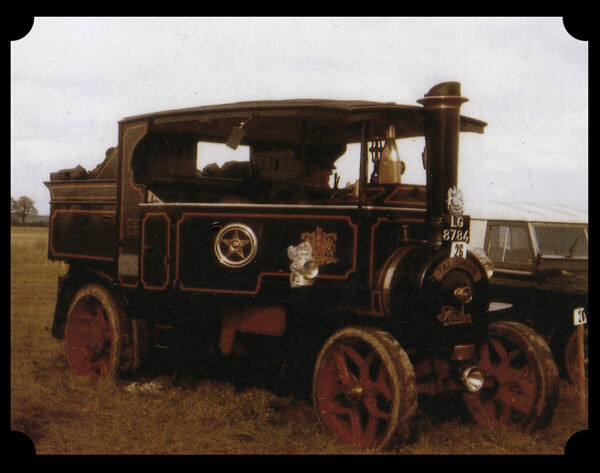 The traffic on this day had been backed up to the A1 and was very slow moving. We arrived at the box junction at the entrance of marsh lane. When the lights had changed the line of traffic we were in moved off. The traffic after the box junction was flowing freely up to the time I was forced to stop in the junction because a number of vehicles are cutting into the inside lane from right and left sides (Not seen in the video until the camera tracks for the number plate which is after the incident. The camera is set in such away that gives a false impression of carriageway conditions and the TFL operators know this ) in some cases forcing those using the inside lane to stop when they need not do so. 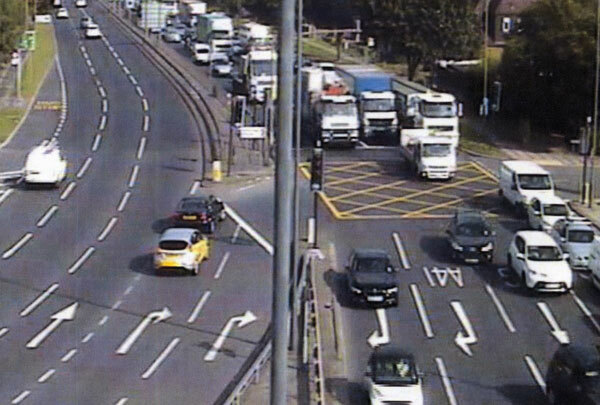 Barnet way junction. badly marked out. Shortly before we were seen stopped in the box someone else was too who was not given a PCN. You can see a van cutting across the traffic forcing it to stop. Which forced us to stop in the box. You can see the truck behind us brake hard which indicated that they thought they would be able to clear the junction as well. 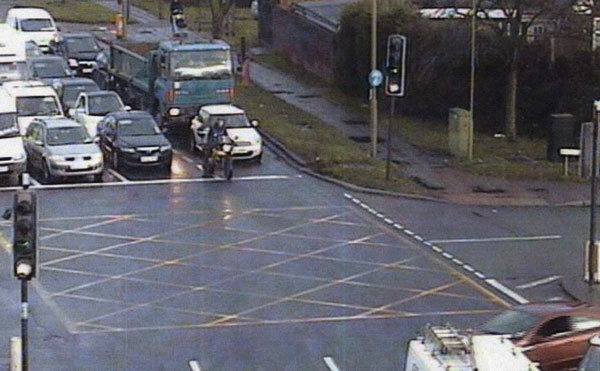 It shows the box junction itself may not be enforceable because it does not comply with the regulation. 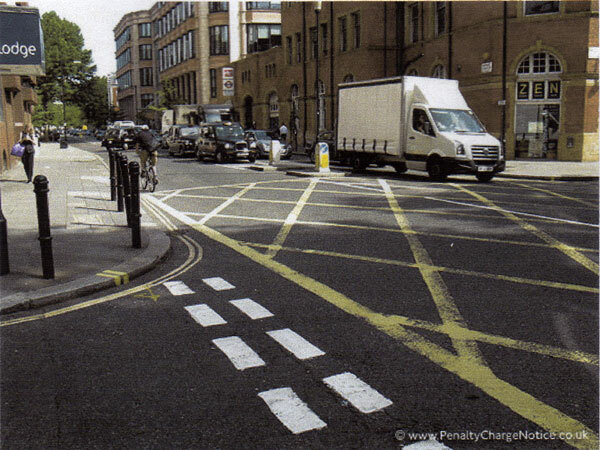 Yellow box junctions are regulated by the ministry of transport and must adhere to them strictly. If the box junction does not then they need a dispensation from M.o.T for them to be lawful. Box junctions cannot extend beyond the corners of the junction. You cannot have two boxes side by side at the same junction it needs to be one big box. The corners of the box should meet all four corners of the junction without gaps. I can understand now why they did not defend this action. Our appeal was upheld because the authority did not contest it. My understanding is that by not contesting it, it cannot set president if they lose. By doing this they can get away with hoodwinking the motoring public to parting with their money falsely. Giving someone a nice big bonus no doubt!. Some of this is opinion and a case of getting it off our chest. With some finger pointing at the society we live in today where it is OK for public authority’s to put their hand in your pocket and we the public just let them get away with it. We would like to thank the sites below for their help and a special thank you to another WordPress blogger for his help shown below. 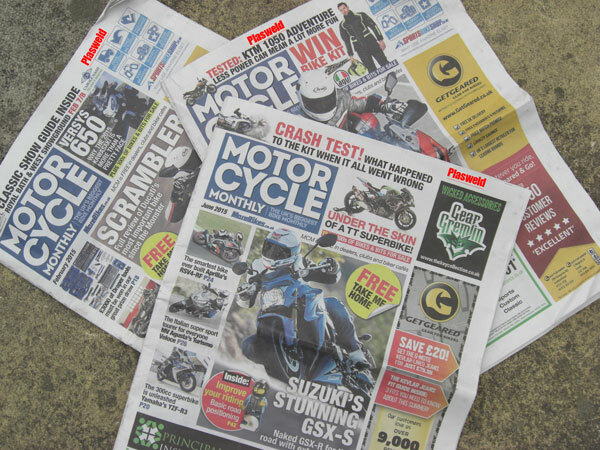 While I am in a generous mood, I’m going to give a little bit of space to promoting motorcycle monthly. It is quite a popular magazine if you know where to pick up a copy. You will not find it on sale in the usual places though – Why? Because it is free. I know, how brilliant is that! It is full of the things you would expect from a glossy magazine; road tests, shoot outs, latest industry news etc. and advertising from us. He! He! I may as well get a plug in for us! All of which is printed on news print, giving it a daily paper feel. 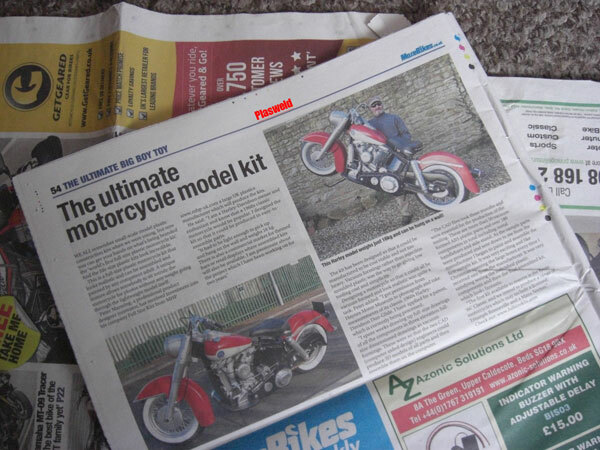 The June edition has a great article on model replicas – bikes that are one to one scale of the original. A 1960s classic Harley Davidson is the first in the series. Guess what? 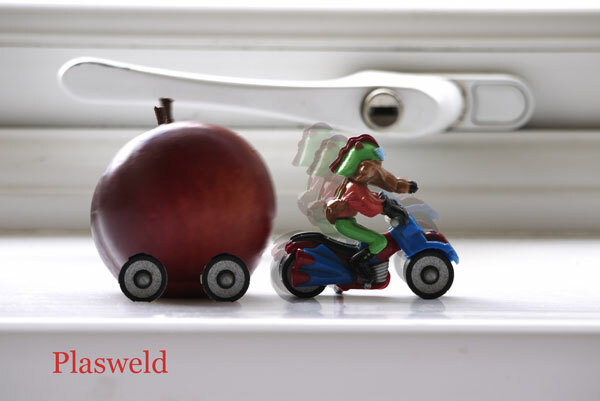 just like with real bikes, if you break it we can repair it!! Trevor has a very particular way of writing and for the uninitiated can be difficult to get a handle on. Please stick with it, it will get easier with time. The picture that appears with the text is related. 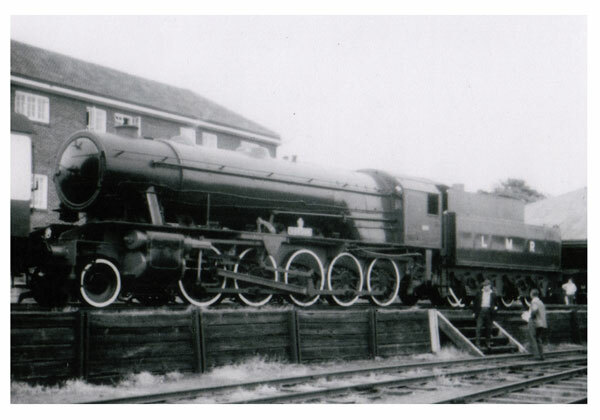 No 600 Gordon, In Bordon Garrison, Liss, Hampshire; Photographed By Ladybird’s Son Birdcage Avery, At The Longmoor Military Railway Final Open Day On 5 July 1969 A.D..